Sir Gawain and the Green Knight by the anonymous Gawain-Poet (or Pearl-Poet) is, like Beowulf, one of the greatest classics of English literature. 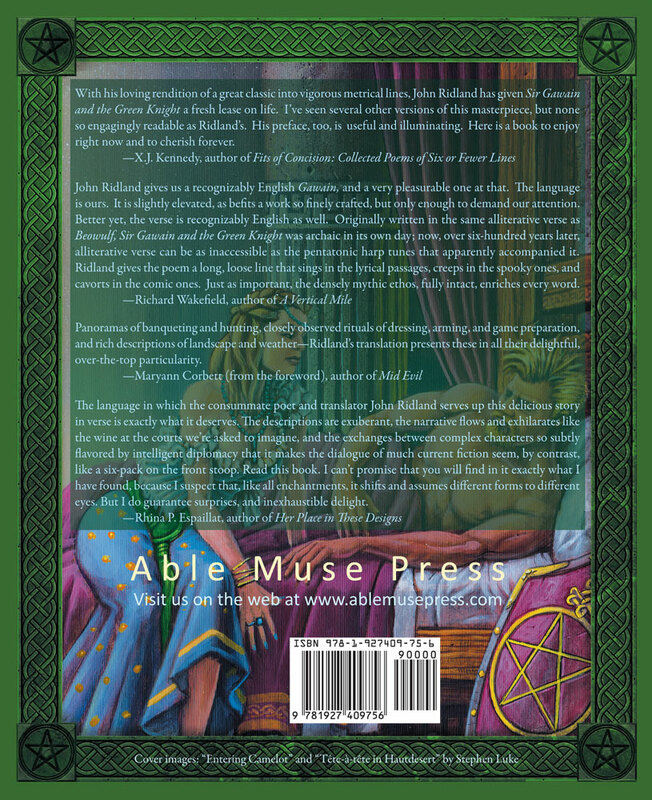 Hailed as the finest Arthurian romance, this technically brilliant tale of enchantment, faith, temptation, and chivalry is tautly constructed, with a wonderfully rich vocabulary and vivid language that blends sophisticated atmosphere with psychological depth. John Ridland’s new Modern English translation, unlike most presentations, is complete, covering every passage and word of the Middle English, Northwest Midland dialect original with the same line numbering, contents and meaning. His is the only version written in a familiar modern meter—pleasurable to modern ears, yet retaining the spirit of repetition and alliteration of the medieval original. And Dr. Ridland’s introduction and notes are enlightening. This translation is a must-have for unlocking all the pleasures and delights of the original classic. 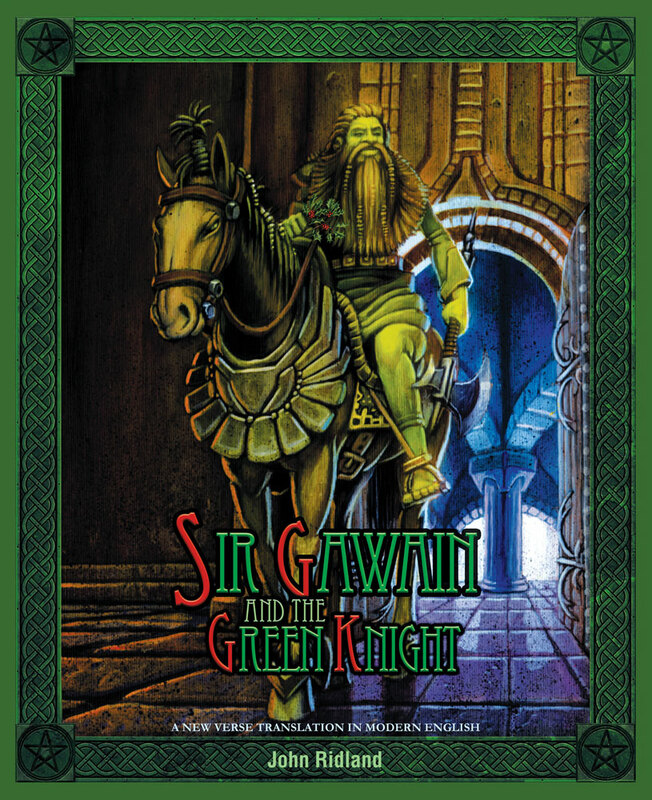 With his loving rendition of a great classic into vigorous metrical lines, John Ridland has given Sir Gawain and the Green Knight a fresh lease on life. I’ve seen several other versions of this masterpiece, but none so engagingly readable as Ridland’s. His preface, too, is useful and illuminating. Here is a book to enjoy right now and to cherish forever. John Ridland gives us a recognizably English Gawain, and a very pleasurable one at that. The language is ours. It is slightly elevated, as befits a work so finely crafted, but only enough to demand our attention. Originally written in the same alliterative verse as Beowulf, Sir Gawain and the Green Knight was archaic in its own day; now, over six-hundred years later, alliterative verse can be as inaccessible as the pentatonic harp tunes that apparently accompanied it. Ridland gives the poem a long, loose line that sings in the lyrical passages, creeps in the spooky ones, and cavorts in the comic ones. Just as important, the densely mythic ethos, fully intact, enriches every word. Panoramas of banqueting and hunting, closely observed rituals of dressing, arming, and game preparation, and rich descriptions of landscape and weather—Ridland’s translation presents these in all their delightful, over-the-top particularity. The language in which the consummate poet and translator John Ridland serves up this delicious story in verse is exactly what it deserves. The descriptions are exuberant, the narrative flows and exhilarates like the wine at the courts we’re asked to imagine, and the exchanges between complex characters so subtly flavored by intelligent diplomacy that it makes the dialogue of much current fiction seem, by contrast, like a six-pack on the front stoop. Read this book. I suspect that, like all enchantments, it shifts and assumes different forms to different eyes. But I do guarantee surprises, and inexhaustible delight. John Ridland, PhD, taught English at the University of California, Santa Barbara, for forty-three years. His publications include A Brahms Card Ballad, first published in Hungarian translation, Happy in an Ordinary Thing, and a book-length translation of Petöfi’s John the Valiant. With Dr. Peter Czipott, Dr. Ridland has translated several other Hungarian poets, including Sándor Márai’s The Withering World (Alma Classics, 2013) and Miklos Rádnoti’s All That Still Matters at All (New American Press, 2014). In 2014 Askew Publications issued his epic poem, A. Lincolniad.